Credit Suisse Group AG, is organised as a joint-stock company registered in Zürich that operates as a holding company. It owns the Credit Suisse bank and other interests in the financial services business. Credit Suisse is governed by a board of directors, its shareholders and independent auditors The Board of Directors organize the annual General Meeting of Shareholders while investors with large stakes in the company determine the agenda. Shareholders elect auditors for one-year terms, approve the annual report and other financial statements, and have other powers granted by law. Shareholders elect members of the board of directors to serve a three-year term based on candidates nominated by the Chairman's and Governance committee and the Board of Directors meet six times a year to vote on company resolutions. The Board sets Credit Suisse's business strategies and approves its compensation principles based on guidance from the compensation committee. It also has the authority to create committees that delegate specific management functions. Credit Suisse's founder, Alfred Escher, was called "the spiritual father of the railway law of 1852," for his work defeating the idea of a state-run railway system in Switzerland in favor of privatization. Escher founded Credit Suisse (originally called the Swiss Credit Institution, i.e., Schweizerische Kreditanstalt) jointly with Allgemeine Deutsche Credit-Anstalt in 1856 primarily to provide domestic funding to railway projects, avoiding French banks that wanted to exert influence over the railway system. Escher aimed to start the company with three million shares and instead sold 218 million shares in three days. The bank was modeled after Crédit Mobilier, a bank funding railway projects in France that was founded two years prior, except Credit Suisse had a more conservative lending policy focused on short-to-medium term loans. In its first year of operation, 25 percent of the bank's revenues was from the Swiss Northeastern Railway, which was being built by Escher's company, Nordostbahn. Credit Suisse played a substantial role in the economic development of Switzerland, helping the country develop its currency system, funding entrepreneurs and investing in the Gotthard railway, which connected Switzerland to the European rail system in 1882. Credit Suisse helped fund the creation of Switzerland's electrical grid through its participation with Elektrobank (now called Elektrowatt), a coalition of organizations that co-financed Switzerland's electrical grid. According to The Handbook on the History of European Banks, "Switzerland's young electricity industry came to assume the same importance as support for railway construction 40 years earlier." The bank also helped fund the effort to disarm and imprison French troops that crossed into Swiss borders in the 1870 Franco-Prussian War. By the end of the war, Credit Suisse had become the largest bank in Switzerland. 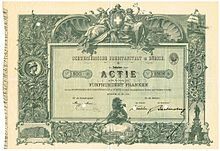 Throughout the late 1800s, Credit Suisse set up banking and insurance companies in Germany, Brussels, Geneva and others (as SKA International) with the bank as a shareholder of each company. It created insurance companies like Swiss RE, Swiss Life, Rentenanstalt and Schweiz. Credit Suisse had its first unprofitable year in 1886, due to losses in agriculture, venture investments, commodities and international trade. The bank created its own sugar beet factory, bought 25,000 shares in animal breeding ventures and supported an export business, Schweizerische Exportgesellschaft, that experienced heavy losses for over-speculative investing. In the early 1900s Credit Suisse began catering to consumers and the middle-class with deposit counters, currency exchanges and savings accounts. The first branch outside of Zürich was opened in 1905 in Basel. The bank helped companies affected by World War I restructuring, and extended loans for reconstruction efforts. During the 1920s depression, net profits and dividends were halved and employees took salary cuts. After World War II, a substantial portion of Credit Suisse's business was in foreign reconstruction efforts. Holocaust survivors had problems trying to retrieve assets from relatives that died in concentration camps without death certificates. This led to a class action lawsuit in 1996 that settled in 2000 for $1.25 billion. The Agreement on the Swiss Banks' Code of Conduct with Regard to the Exercise of Due Diligence was created in the 1970s, after a Credit Suisse branch in Chiasso was exposed for illegally funneling $900 million in Italian deposits to speculative investments. In 1978, White, Weld & Company dropped its partnership with Credit Suisse after it was bought by Merrill Lynch. To replace the partnership with White, Credit Suisse partnered with First Boston to create Credit Suisse First Boston in Europe and bought a 44 percent stake in First Boston's US operations. In 1987, the Group acquired the blue chip London stockbrokers Buckmaster & Moore. Originally established by Irish aristocrat Charles Armytage-Moore and sportsman Walter Buckmaster, who had met at Repton School. As stockbrokers they were very well connected, had developed a good private client business, which at one time included John Maynard Keynes. Other Credit Suisse First Boston brands were later created in Switzerland, Asia, London, New York and Tokyo. According to an article in The New York Times, First Boston became "the superstar of the Euromarkets" by buying stakes in American companies that wanted to issue bonds. In 1988 First Boston loaned $487 million to Gibbons and Green for the purchase of the Ohio Mattress Company, which was purchased at twenty times its annual revenue. Gibbons had also borrowed $475 million in junk bonds. When the junk bonds market crashed the following year, Gibbons couldn't repay First Boston. Credit Suisse injected $725 million to keep First Boston in business, which ultimately led to the company being taken over by Credit Suisse. This became known as the "burning bed" deal, because the Federal Reserve overlooked the Glass–Steagall Act that requires separation between commercial and investment banks in order to preserve the stability of the financial markets. In the late 1990s Credit Suisse executed an aggressive acquisition strategy. 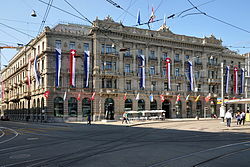 The bank acquired Bank Leu, known as Switzerland's oldest bank, in 1990. In 1993 Credit Suisse outbid UBS for a controlling stake in Switzerland's fifth largest bank, Swiss Volksbank in a $1.1 billion deal. It also merged with Winterthur Group in 1997 for about $9 billion and acquired the asset management division of Warburg, Pincus & Co. in 1999 for $650 million. Donaldson, Lufkin & Jenrette was purchased for $11.5 billion in 2000. In 1996 Credit Suisse restructured as the Credit Suisse Group with four divisions: Credit Suisse Volksbank (later called Credit Suisse Bank) for domestic banking, Credit Suisse Private Banking, Credit Suisse Asset Management and Credit Suisse First Boston for corporate and investment banking. The restructure was expected to cost the company $800 million and result in 7,000 lost jobs, but save $560 million a year. While Credit Suisse First Boston had been struggling, Credit Suisse's overall profits had grown 20 percent over the prior year, reaching $664 million. In 1999 Japan's Financial Supervisory Agency temporarily suspended the financial-products division's license to operate in Japan for "window dressing," the practice of selling derivatives that are often used by bank clients to hide losses. In the 2000s Credit Suisse executed a series of restructures. In 2002 the bank was consolidated into two entities: Credit Suisse First Boston for investments and Credit Suisse Financial Services. A third unit was added in 2004 for insurance. Credit Suisse restructured again in 2004 under what it calls the "one bank" model. Under the restructuring, every board had a mix of executives from all three divisions. It also changed the compensation and commission models to encourage cross-division referrals and created a "solution partners" group that functions between the investment and private banking divisions. Following the restructure Credit Suisse's private banking division grew 19 percent per year despite the economic crisis. The firm bumped long-time rival UBS off the number one position in Euromoney's private banking poll. In 2006, Credit Suisse acknowledged misconduct for helping Iran and other countries hide transactions from US authorities and paid a $536 million settlement. The same year it merged Bank Leu AG, Clariden Holding AG, Bank Hofmann AG and BGP Banca di Gestione Patrimoniale into a new company called Clariden Leu. The increasing importance of sustainability and the related commitments and liabilities of international standards such as the UNGC, of which the bank is a member, lead to an increasingly sophisticated and ambitious risk management over the years. Credit Suisse operates a process which since 2007 uses RepRisk, a Swiss provider of ESG Risk analytics and metrics, to screen and evaluate environmental and social risks of risky transactions and due diligence. In 2009 Yellowstone Club founder Tim Blixseth sued Credit Suisse when the bank attempted to collect on $286 million in loan debt during Yellowstone's bankruptcy proceedings. The debtor had borrowed more than $300 million for the business, but used a large portion of it for personal use before eventually filing for bankruptcy. Four lawsuits were filed from other resorts seeking $24 billion in damages alleging Credit Suisse created loans with the intention of taking over their properties upon default. According to The Wall Street Journal, "Credit Suisse survived the credit crisis better than many competitors." Credit Suisse had $902 million in writedowns for subprime holdings and the same amount for leveraged loans, but it did not have to borrow from the government. Along with other banks, Credit Suisse was investigated and sued by US authorities for bundling mortgage loans with securities, misrepresenting the risks of underlying mortgages during the housing boom. Following the crisis, Credit Suisse cut more than one-trillion in assets and made plans to cut its investment banking arm 37 percent by 2014. It reduced emphasis on investment banking and focused on private banking and wealth management. In July 2011, Credit Suisse cut 2,000 jobs in response to a weaker than expected economic recovery and later merged its asset management with the private bank group to cut additional costs. A series of international investigations took place in the early 2000s regarding the use banking secrecy in Credit Suisse accounts for tax evasion. The Brazilian government investigated 13 former and current Credit Suisse employees in 2008. The investigation led to arrests that year and in 2009 as part of a larger crackdown in Brazil. Four Credit Suisse bankers were accused of fraud by the US Justice Department in 2011 for helping wealthy Americans avoid taxes. German authorities found that citizens were using insurance policies of a Bermuda-based Credit Suisse subsidiary to earn tax-free interest. In November 2012, Credit Suisse's asset management division was merged with the private banking arm. In September 2012, the Swiss government gave banks like Credit Suisse permission to provide information to the US Justice Department for tax evasion probes. In February 2014 it agreed to pay a fine of $197 million after one of its businesses served 8,500 US clients without registering its activities, leading to suspicion as to whether it was helping Americans evade taxes. It was one of 14 Swiss banks under investigation. Separately, in 2013, German authorities began to probe Credit Suisse, its private bank subsidiary Clariden Leu, and its regional subsidiary Neue Aargauer Bank for helping German citizens evade taxes. The bank eventually entered into a €150 million settlement with the government. In March 2014, Credit Suisse denied claims it had been drawn into a Swiss competition probe investigating potential collusion to manipulate foreign exchange rates by various Swiss and foreign banks. In May 2014, Credit Suisse pleaded guilty to conspiring to aid tax evasion. It was the most prominent bank to plead guilty in the United States since Drexel Burnham Lambert in 1989 and the largest to do so since the Bankers Trust in 1999. "Credit Suisse conspired to help U.S. citizens hide assets in offshore accounts in order to evade paying taxes. When a bank engages in misconduct this brazen, it should expect that the Justice Department will pursue criminal prosecution to the fullest extent possible, as has happened here," Attorney General Eric H. Holder said at the time. Holder also said "This case shows that no financial institution, no matter its size or global reach, is above the law." Credit Suisse shares rose 1% on the day the $2.6 billion penalty was announced. On 10 March 2015, it was announced that Tidjane Thiam, the CEO of Prudential would leave to become the next CEO of Credit Suisse. In September 2016, Brian Chin was appointed Chief Executive of Global Markets and joined the executive board of the bank. At this time, it was also announced that Eric M. Varvel was appointed president and CEO of Credit Suisse Holdings (USA). Since the financial crisis in 2008 share prices of Credit Suisse and other Swiss banks including UBS have remained mostly stagnant or flat. This is seen as a result of the aftermath of the collapse of Lehman Brothers, which caused a large loss in consumer and market participant trust and confidence in the banking industry. The loss in confidence is reflected in the large loss of share prices across the Swiss banking sector after 2008, which have never recovered (and possibly never will) to pre-financial crisis levels. Credit Suisse endorses a strategy called bancassurance of trying to be a single company that offers every common financial services product. The investment bank is intended for companies and wealthy individuals with more than 50,000 euro. Credit Suisse is a member of Wall Street's bulge bracket, a list of nine of the largest and most profitable banks. The company has been identified as one of the world's most important banks, upon which international financial stability depends. The bank is also one of Fortune Magazine's most admired companies. Credit Suisse has been recognized as the world's best private bank by Euromoney's Global Private Banking Survey and as the best European Equity Manager by Global Investors. In polls by Euromoney, it has been ranked as the top private bank and the best bank in Switzerland. As of 2004, Credit Suisse was first in volume of high-yield transactions, second for corporate high-yield bond insurance and third for IPO underwriting. The Securities Data Company ranked Credit Suisse as the fourth best place for financial advice for mergers and acquisitions in the US in 1995 and sixth for domestic equity issues. Credit Suisse has been recognized by the Asset Triple A Awards and in 2005 Credit Suisse was ranked as the second best prime broker by Institutional Investor. On July 5 2018, Credit Suisse agreed to pay a $47 million fine to the U.S. Department of Justice and $30 million to resolve charges of the U.S. Securities and Exchange Commission (SEC), the SEC’s investigation said that the banking group sought banking-investment business in the Asian-Pacific region by hiring and promoting more than one hundred Chinese officials and related people in violation of the Foreign Corrupt Practices Act. ^ a b c d e f g "Annual Earnings 2018" (PDF). Credit Suisse. Retrieved 14 February 2019. ^ "Credit Suisse Pleads Guilty to Conspiracy to Aid and Assist U.S. Taxpayers in Filing False Returns". Department of Justice. 19 May 2014. Retrieved 19 June 2016. ^ "Credit Suisse fined $2.6bn in US tax evasion case". Switzerland News.Net. Retrieved 20 May 2014. ^ "Annual Report 2017" (PDF). Credit Suisse. Retrieved 9 May 2018. ^ a b "Articles of Association of Credit Suisse Group AG" (PDF). Credit Suisse. Archived from the original (PDF) on 19 February 2013. Retrieved 20 November 2012. ^ "Corporate Governance Guidelines of Credit Suisse AG" (PDF). Credit Suisse. Archived from the original (PDF) on 6 June 2013. Retrieved 20 November 2012. ^ "Organizational Guidelines and Regulations of Credit Suisse Group AG and of Credit Suisse AG" (PDF). Credit Suisse. Archived from the original (PDF) on 6 June 2013. Retrieved 20 November 2012. ^ "Board of Directors". Credit Suisse. Retrieved 5 March 2019. ^ "Executive Board". Credit Suisse. Retrieved 5 March 2019. ^ B. H. Meyer; Hans Dietler (1899). "The Regulation and Nationalization of the Swiss Railways". Annals of the American Academy of Political and Social Science. Sage. 13: 1–30. doi:10.1177/000271629901300201. ISSN 0002-7162. JSTOR 1009453. ^ a b c d e f g h Henri B. Meier; John E. Marthinsen; Pascal A. Gantenbein (1 October 2012). Swiss Finance: Capital Markets, Banking, and the Swiss Value Chain. John Wiley & Sons. p. 89. ISBN 978-1-118-22508-0. ^ Joseph., Jung, (2000). From Schweizerische Kreditanstalt to Credit Suisse Group : the history of a bank. Zurich: NZZ Verlag. ISBN 3858238910. OCLC 45803230. ^ a b c d e f g Pohl, Manfred (1994). Handbook on the History of European Banks. Edward Elgar Publishing. p. 1016. ISBN 978-1-85278-919-0. ^ a b c d e Sandy Franks; Sara Nunnally (2010). Barbarians of Wealth: Protecting Yourself from Today's Financial Attilas. John Wiley & Sons. p. 198. ISBN 978-0-470-94658-9. ^ a b c d Jung, Joseph (2000). From Schweizerische Kreditanstalt to Credit Suisse Group: The History of a Bank. NZZ Verlag. ISBN 3-85823-891-0. ^ Hausman, William J.; Hertner, Peter; Wilkins, Mira (2008). Global Electrification: Multinational Enterprise and International Finance in the History of Light and Power, 1878–2007. Cambridge University Press. p. 98. ISBN 978-0-521-88035-0. ^ Hill, Kelly (1999). Cases in Corporate Acquisitions, Buyouts, Mergers, and Takeovers. Gale. ISBN 0-7876-3894-3. ^ a b Meier, P. J. (June 1960). "Reviewed Work: Schweizerische Kreditanstalt 1856–1956 by Walter Adolph Jöhr". The Journal of Economic History. Cambridge University Press. 20 (2): 328. JSTOR 2114865. ^ Jung, Joseph (2002). Credit Suisse Group Banks in the Second World War: A Critical Review (2nd ed.). Neue Zürcher Zeitung. ISBN 3-85823-994-1. ^ Honan, William H. (16 April 1999). "Estelle Sapir, 73, Who Fought Bank Over Holocaust Assets". The New York Times. Retrieved 12 October 2012. ^ Atkinson, Mark (4 August 2000). "Swiss banks agree $1.25bn Holocaust deal". The Guardian. Retrieved 12 October 2012. ^ Vischer, Frank (2001). "Der Handel mit ausländischen Wertpapieren während des Krieges und die Probleme der deutschen Guthaben in der Schweiz sowie der nachrichtlosen Vermögen aus rechtlicher Sicht". Die Schweiz, der Nationalsozialismus und das Recht, Bd. 2. Chronos. ISBN 978-3-0340-0619-4. ^ a b Andrews, Edmund L. (23 October 1998). "International Business: When the Sure-Footed Stumble; Swiss Banks Stagger After Several Investing Missteps". The New York Times. Retrieved 27 August 2012. ^ "Banking: Suicide in Switzerland". Time. Vol. 109 no. 21. 23 May 1977. p. 82. ^ Gambee, Robert (1999). Wall Street: Financial Capital. W. W. Norton & Company. p. 123. ISBN 978-0-393-04767-7. ^ Crabbe, Matthew (January 1989). "Gut's Secret Money". Euromoney. Archived from the original on 18 May 2013. Retrieved 27 August 2012. ^ a b Greenhouse, Steven (10 April 1989). "Swiss Bank Turns Aggressive". The New York Times. pp. D1–D2. Retrieved 27 August 2012. ^ Grant, Linda (19 August 1996). "Will CS First Boston Ever Win?". Fortune. pp. 30–34. Archived from the original on 3 December 2013. Retrieved 27 August 2012. ^ Cooper, Ron (14 October 1991). "Gut Instincts". Forbes. Vol. 148 no. 8. pp. 169–170. ^ Thomasson, Emma (15 November 2011). "Update 5-C: Suisse ends oldest Swiss bank brand Leu". Reuters. Retrieved 21 November 2012. ^ "Offer Made to Create Largest Swiss Bank Group". The New York Times. 6 January 1993. Retrieved 21 November 2012. ^ Olson, Elizabeth (21 June 2002). "Credit Suisse's Insurance Unit To Get Infusion of $1.1 Billion". The New York Times. Retrieved 30 November 2012. ^ Gasparino, Charles (16 February 1999). "Credit Suisse Agrees to Purchase Unit of Warburg Pincus for $650 Million". The Wall Street Journal. p. B14. ^ Fairlamb, David; Rossant, John; Thornton, Emily (11 September 2000). "This Bank Keeps Growing And Growing And ..." Business Week. p. 134. Retrieved 3 October 2012. ^ a b c Tagliabue, John (29 November 1996). "Taking the Challenge of Streamlining Credit Suisse". The New York Times. pp. D9, D14. Retrieved 27 August 2012. ^ "Credit Suisse Restructures". The Banker. August 1996. p. 5. ^ Strom, Stephanie (30 July 1999). "Japan Revokes Credit Suisse Unit's Banking License". The New York Times. Retrieved 27 August 2012. ^ a b c Avery, Helen (2010). "Credit Suisse reaches the summit of private banking". Euromoney. 41 (490). pp. 56–60. ^ Gatti, Claudio; Eligon, John (15 December 2009). "Iranian Dealings Lead to a Fine for Credit Suisse". The New York Times. Retrieved 20 November 2012. ^ a b Lucchetti, Aaron; Solomon, Jay (17 December 2009). "Credit Suisse's Secret Deals". The Wall Street Journal. Retrieved 13 October 2012. ^ Ratcliffe, Alice (27 April 2006). "Credit Suisse to Merge Private Banks to Raise Profit". Bloomberg. Retrieved 19 November 2012. ^ "Bankruptcy case heats up for former Oregon timber tycoon Tim Blixseth". The Oregonian. Associated Press. 24 February 2010. Retrieved 30 November 2012. ^ Church, Steven; Effinger, Anthony (6 April 2011). "Tim Blixseth facing forced bankruptcy over taxes". Bloomberg. Retrieved 30 November 2012. ^ Stempel, Jonathan (4 January 2010). "Credit Suisse sued over resorts, $24 billion sought". Reuters. ^ Mijuk, Goran (18 January 2008). "Credit Suisse Plans to Expand Private Banking World-Wide". The Wall Street Journal. Retrieved 21 October 2012. ^ Simonian, Haig (11 February 2009). "Credit Suisse losses widen to SFr8bn". Financial Times. Retrieved 9 October 2012. ^ Reuters (20 November 2012). "New York Sues Credit Suisse Over Mortgages". The New York Times. Retrieved 29 November 2012. ^ Freifeld, Karen; Frankel, Alison (4 October 2012). "Exclusive: Credit Suisse probed over mortgages – sources". Reuters. Retrieved 4 October 2012. ^ Greil, Anita; Lucchetti, Aaron (26 September 2012). "Credit Suisse May Revamp Asset-Management Unit". The Wall Street Journal. Retrieved 29 November 2012. ^ Kandell, Jonathan (March 2012). "Swiss Banks Adjusting To Radical New Regulations". Institutional Investor. Vol. 46 no. 2. p. 33. ^ Murphy, Megan (28 July 2011). "Credit Suisse to axe 2,000 jobs". Financial Times. Retrieved 20 November 2012. ^ Logutenkova, Elena (20 November 2012). "Credit Suisse to Revamp Investment Banking, Private Bank". BusinessWeek. Retrieved 29 November 2012. ^ Bloomberg Surveillance (24 January 2018). "Tidjane Thiam Says Markets and Volatility Are Going Up". Retrieved 24 January 2018. ^ Barreto, Elzio (23 April 2008). "Credit Suisse banker arrested in Brazil tax probe". Reuters. Retrieved 19 January 2013. ^ Associate Press (11 February 2009). "Brazil Arrests 19 In Tax Evasion Scheme". CBS News. Retrieved 19 January 2013. ^ Browning, Lynnley; Werdigier, Julia (23 February 2011). "U.S. Accuses Four Bankers Connected to Credit Suisse of Helping Americans Evade Taxes". The New York Times. Retrieved 19 November 2012. ^ Voreacos, David (15 August 2011). "Credit Suisse May Settle U.S. Probe by Admitting Wrongdoing, Paying Fine". Bloomberg. Retrieved 20 November 2012. ^ Crawford, David; Saunders, Laura (11 July 2012). "Clients of Swiss Bank Raided in Tax Probe". The Wall Street Journal. ^ Bart, Katharina (20 November 2012). "Credit Suisse shuffles top executives, merges units". Reuters. Retrieved 23 November 2012. ^ Greil, Anita (17 September 2012). "Credit Suisse to Give More Files". The Wall Street Journal. Retrieved 7 September 2013. ^ Schoenberg, Tom; Voreacos, David (21 February 2014). "Credit Suisse to Pay $197 Million in SEC U.S. Client Case". Bloomberg. Retrieved 27 March 2014. ^ Han Shih, Toh (20 April 2013). "German prosecutors probe Credit Suisse tax evasion". South China Morning Post. Retrieved 7 September 2013. ^ Crawford, David (8 November 2012). "Germany Probes UBS Staff on Tax-Evasion Allegations". Wall Street Journal. Retrieved 18 January 2014. ^ "Credit Suisse AG says not subject to Swiss competition foreign exchange probe". Economic Times. 31 March 2014. Retrieved 8 August 2014. ^ "Credit Suisse Pleads Guilty in Felony Case". Dealbook – New York Times. Retrieved 20 May 2014. ^ Bart, Katherina; Freifeld, Karen; Viswana, Aruna (22 May 2014). "Credit Suisse guilty plea has little immediate impact as shares rise". Business Standard. ^ Milmo, Dan (10 March 2015). "Prudential's Tidjane Thiam to take top role at Credit Suisse". The Guardian. Retrieved 10 March 2015. ^ Ganesan, Gayathree. "Credit Suisse names new CEO of global markets". Business Insider. ^ "Credit Suisse Group Bilanz, Gewinn und Umsatz | Credit Suisse Group Geschäftsbericht | 876800". wallstreet-online.de. Retrieved 6 November 2018. ^ Langley, Alison (3 October 2002). "Credit Suisse To Prop Up Insurer Unit". The New York Times. ^ Maude, David (2006). Global Private Banking and Wealth Management: The New Realities. John Wiley & Sons. ISBN 978-0-470-03053-0. ^ McDonald, Oonagh; Keasey, Kevin (2003). The Future of Retail Banking in Europe: A View from the Top. John Wiley & Sons. p. 176. ISBN 978-0-470-85574-4. ^ Crouhy, Michel; Galai, Dan; Mark, Robert (January 2000). "A comparative analysis of current credit risk models". Journal of Banking & Finance. 24 (1–2): 59–117. doi:10.1016/S0378-4266(99)00053-9. ^ Jones, Sam (29 April 2012). "Credit Suisse fund plans London float". Financial Times. ^ Plunkett, Jack W. (2005). Plunkett's Banking, Mortgages and Credit Industry Almanac 2006. Plunkett Research. p. 222. ISBN 978-1-59392-381-5. ^ Fischer, Layna, ed. (2003). Excellence in Practice: Innovation and Excellence in Workflow and Business Process Management. 5. Future Strategies. p. 171. ISBN 978-0-9703509-5-4. ^ Jones, Sam (11 January 2012). "Credit Suisse offers trades for eurozone shorting". Financial Times. ^ Jones, Sam (17 November 2012). "Investors grapple with sector's multiple choices". Financial Times. ^ Strasburg, Jenny (15 September 2010). "Credit Suisse Adds Heft in Hedge Fund as Rivals Exit". The Wall Street Journal. Retrieved 29 November 2012. ^ Darbyshire, Paul; Hampton, David (2012). Hedge Fund Modeling and Analysis Using Excel and VBA. John Wiley & Sons. p. 250. ISBN 978-1-119-94563-5. ^ "Credit Suisse's Top Holdings: A Brief Analysis". Seeking Alpha. 29 March 2011. Retrieved 21 October 2012. ^ a b Marshall, Julian (1999). "Best European Equity Manager: Credit Suisse Asset Management". Global Investor. 119: 15. ^ Ceron, Gaston (9 April 2002). "Credit Suisse Fund Manager Tries to Do More With Less". The Wall Street Journal. p. C27. ^ "Investment Strategy". Credit Suisse. Archived from the original on 3 November 2012. Retrieved 21 November 2012. ^ Eavis, Peter (1 November 2012). "The List That Big Banks Don't Wish to Be On". The New York Times / DealBook. Retrieved 21 November 2012. ^ "Update of group of global systemically important banks (G-SIBs)" (PDF). Financial Stability Board. 1 November 2012. Archived from the original (PDF) on 19 November 2012. Retrieved 19 November 2012. ^ "World's Most Admired Companies: Credit Suisse". Fortune via CNN Money. 2011. Retrieved 21 November 2012. ^ "Credit Suisse retains crown as top global private bank in benchmark Euromoney survey". Euromoney. 7 February 2012. Retrieved 29 November 2012. ^ a b c d Loosvelt, Derek (2006). Vault Guide to the Top Financial Services Employers. Vault. p. 134. ISBN 978-1-58131-416-8. ^ "SEC.gov | SEC Charges Credit Suisse With FCPA Violations". www.sec.gov. Retrieved 14 February 2019. ^ 25 Top Financial Services Firms. WetFeet. 2008. p. 35. ISBN 978-1-58207-801-4. Wikimedia Commons has media related to Credit Suisse.